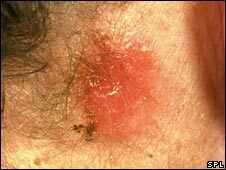 Skin cancers on the scalp or neck are more deadly than those elsewhere on the body, a large study has suggested. An analysis of 50,000 cases of melanoma found people with these cancers were nearly twice as likely to die as those with the disease on arms or legs. Scalp and neck cancers were often found later but there seemed to be something inherently virulent about them, the Archives of Dermatology study found. Survival rates from skin cancer are nonetheless relatively high. The five-year survival rate for patients with scalp or neck cancer was 83%, compared with 92% for those with melanomas on the face and ears and on the extremities - the arms, legs, hands and feet. A team at the University of North Carolina School of Medicine found cancers on the scalp and neck appeared to be thicker and were more likely to be ulcerated than cancers at other sites. The lymph nodes were also more often affected in patients with scalp and neck cancers than in the other skin cancer groups. The researchers acknowledged that people with cancers in areas likely to be hidden by hair were more likely to spot skin abnormalities later. "Only 6% of melanomas present with the disease on the scalp or neck, but those patients account for 10% of melanoma deaths," said Nancy Thomas, a professor of dermatology who led the research. "That's why we need extra time to look at the scalp during full-skin examinations." Patients with skin cancers in this area tended to be slightly older - 59 as opposed to an average of 55 in the study - and were more likely to be male. The British Skin Foundation said the study showed why it was necessary to cover up well when exposing the body to intense sunshine. "Generally, when people are protecting themselves from the sun, the head and neck do not receive the same attention as the rest of the body," said spokeswoman Indy Rihal. She added: "You must not ignore your neck and scalp. This new piece of research highlights the importance of this, so make sure that you always wear a wide-brimmed hat to protect your scalp, face and neck too." Cancer Research UK also welcomed the study. "Melanomas can grow anywhere on the body so it's crucial to check all areas of your skin regularly for any unusual changes, as the disease is much easier to treat when it's spotted earlier," said Dr Alison Ross.